A petiole of Kalanchoe tubiflora is elongated and a leaf blade is reduced at the tip. 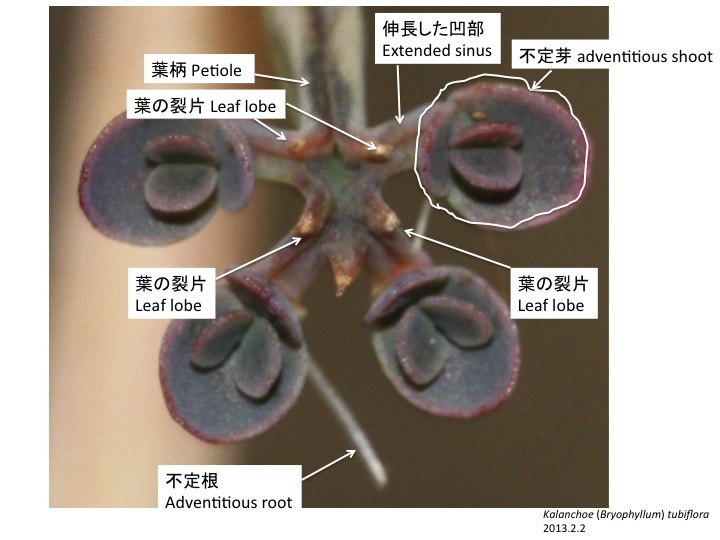 Can you explain the curious morphology of the leaf blade? Protruded regions are leaf lobes and plantlets are formed on sinuses. When plantlets become bigger, sinus tissue elongate to subtend a plantlet. Garcês et al. (2007) described development of leaf plantlet of Kalanchoe daigremontiana. At first, tissue protrude as a dome and then becomes to be resemble to globular stage embryo as well as shoot apex. Then, the tissue becomes similar to a hart-shaped embryo. However, differently from an embryo, adventitious roots are formed. Vascular bundles are formed independent from leaf vasculature. The authors interpret that the development of leaf plantlet is a mixture of embryo and shoot development. Garces, H.M., Champagne, C.E., Townsley, B.T., Park, S., Malho, R., Pedroso, M.C., Harada, J.J., and Sinha, N.R. (2007). 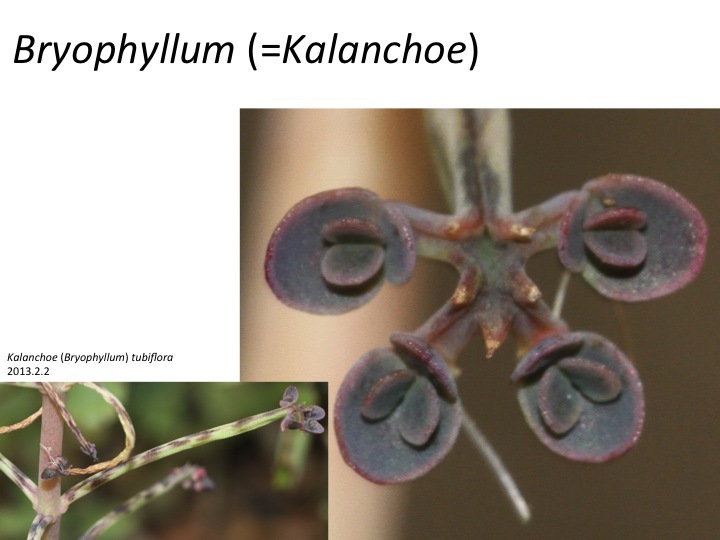 Evolution of asexual reproduction in leaves of the genus Kalanchoe. Proc Natl Acad Sci U S A 104, 15578-15583.